Destination Weddings Bali: Why you need a wedding planner! If your planning a destination wedding in Bali and are thinking about having it on this wonderful island, well your off to a good start. Bali, is the ultimate wedding destination paradise loved by couples all over the world, especially Australian’s. But, before you start packing your bags and booking your ticket there are a few essential ingredients that go into having a successful destination Bali wedding. The main one being; a wedding planner. Without the help of one, your wedding is headed for trouble! Planning your destination wedding Bali alone may seem like a good idea but, let’s be honest here what’s the point of saving a few dollars if there are disasters lurking on attempting a DIY Bali wedding. Having a wedding planner will save you all the headaches & hassles associated with a destination wedding, especially when it’s in a foreign country. Bali’s great if your coming here for a holiday and a few weeks lazing by the pool, but a wedding is a completely different story. #1: Unless you can speak Bahasa Indonesian fluently your going to run into problems with any type of destination weddings Bali. This is a 100% guarantee! If you think you will be able to haggle prices down just because you’re a westerner in a third world country, then your wrong. Local Balinese wedding suppliers will see a cashed up foreigner coming a mile away and prices will surely go up. Wedding planners have supply contracts in place so your going to be getting the best deals possible when it comes to your flowers, music, villa accommodation venues, food and alcohol and hair / make up. At Your Bali Wedding we have been dealing with the same suppliers for years & have a great relationship with all them. This means as a client of ours you will get the very best rates without any compromise on service or quality. # 2: Why would you want to spend the time before your wedding running around stressing out, and going over last minute details when all of this can be handled by a wedding planner. This is their job and this is what they do best. You have got absolutely zero experience dealing with suppliers in Bali so its best to leave it to the experts. All you should be doing is having fun, relaxing and enjoying your time before the big day. # 3: If you have never been to Bali before or never been to a Bali wedding previously you won’t know the types of fabulous wedding styles and options there are for you. A Bali wedding is much more than simply saying your vows, taking a few photos by the beach and having a party. 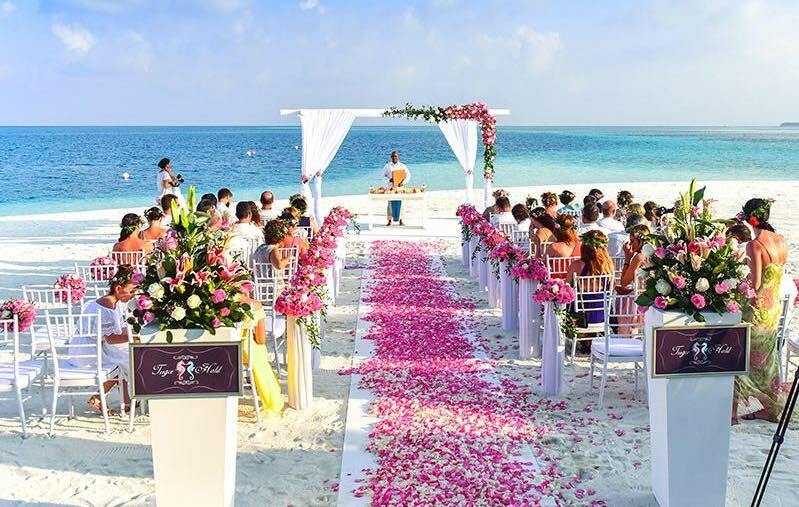 A wedding planner can advice you on the best places to have your wedding; whether it be in a villa, a beach wedding, next to some gorgeous picturesque rice fields or on a cliff top with a scenic ocean back drop. Plus, they’ll be able to customise your wedding tailored to your specific budget and style. After all, it’s one of the biggest days of your life so you want to make it that much more unique & personal. # 4: A wedding planner will have a range of wedding packages that you can easily choose from. This gives you the flexibility and confidence knowing exactly what your getting for your wedding. This will give you time to plan and save for the wedding. We have some fabulous wedding packages to choose from. Contact Cindy at Your Bali Weddings to see our amazing wedding packages. # 5: A wedding planner will be able to organise all the accommodation and airport transfers for you and your guests if they are staying in a luxury Seminyak Villa, Canggu beach villa or Uluwatu clifftop villa. Just imagine the hassle of you having to arrange all the accommodation for your family, in laws and friends. What a nightmare! Leave it to your wedding planner who will be able to organise it so everyone is staying close to each other. Remember, they’ll be able to get better villa deals than you will. These are just a few reasons why it’s imperative to have wedding planner for your destination wedding in Bali. There are loads more but these should be enough to convince you of the merits of leaving it to people who do this all year round. To get started on your destination wedding contact us here. How much is a destination wedding in Bali? This can vary extensively depending on the venue, how many guests you intend to have, where your having the wedding and what level of service and food do you require? All these variables add up to determine the cost of your designation wedding. In Bali, these costs should be told to you in advance by your wedding planner. Ideally, if your not getting a customised wedding, go for an all inclusive wedding package that will have a cost per guest which will make it a lot easier for your to budget and plan. Most destination weddings come in at around the AUD $15, 000 mark which is about average for roughly 30-50 guests. How do you book a destination wedding? The best thing you can do is Google ‘wedding planners in Bali’ and go from there. Talk to the pro’s who have done this thousands of times before. This is the best way to go. They will be able to handle everything for you and book your Bali destination wedding. How can you trust your wedding planner? Ask to see reviews and photos of past weddings. This is the best way to see if the are legitimate and will deliver on what they’re promising. Also go with a company that’s been around for a while and not a start up who is not seasoned in handling weddings. Make sure they also have a good command of the English language! Do I have to pay for the guests? If they are coming for your wedding, then it’s up to you how you want to handle this. Most couples will pay for the ceremony and the party as well as the venue. But, again it’s your call when it comes to things like accommodation and entertainment after the wedding day. We find that most guests prefer to stay in large Bali villas where everyone is together and this can be paid by each party paying their own share of the villa cost. Villas in Bali, can get pricey especially if your renting large wedding estates, so it’s a good idea to split the cost. Do you give a gift for a destination wedding in Bali? That’s up to the guests.Some may feel that their time in coming over to Bali is a gift in itself but most people will come with a separate gift. Do I pay for guests airfares Bali? Not unless your very wealthy. Although airfares from Australia can be quite cheap most couples ten to let guests (except close relatives) pay for their now travel. Who will do my make-up & hair before the wedding? Your wedding planner will ave all of this organised for you and your make up artists and hairdresser will come to your villa on the day of your wedding to make sure you look fabulous. They will also do your bridesmaids hair and make up. What’s the main advantage of having a destination wedding in Bali? There are so may reasons for having your wedding in Bali & not back in Australia but the main reason is the island itself. Bali is a gorgeous destination, close to Australia so it makes perfect sense to take full advantage of what the island has to offer in terms of a wedding destination. And yes, you get loads more bang for your buck. If the idea of a wedding in Bali now seems like a great idea and you’d like to explore this further, get in touch with Cindy, your destination weddings Bali expert.